I am a proud mom to a 13 year old daughter and a 10 year old son. I have always worked. In fact, in lieu of a 12 week maternity leave, I went back to work in 6 weeks and 3 weeks, respectively, after each was born. (My kids are adopted, but by law I’m afforded the standard 3 month leave, should I choose to take it). My children have always known me as a “working mom.” And they’ve grown up learning what that means, both the good and the bad side of it all. I have long said that I am a better mother BECAUSE I work. And I’m not the only one. Studies suggest women who work and fulfill personal aspirations are more psychologically equipped for parenting. 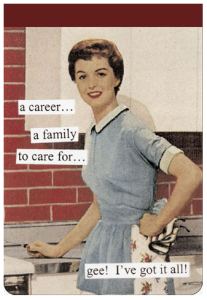 And this line of thinking – that working mothers are good for families -- isn’t new. An eight-year study in 1955 “found no significant differences in school performance, psychosomatic symptoms, or closeness to their mothers” between children of working and nonworking mothers. It’s been shown, too, that toddlers with working moms grew up to have fewer problems with depression or anxiety and got better marks from teachers. Billy said $#&% on the bus. What does that mean? I threw up at school today, but I feel fine now. With work and family coming at you from all sides 24/7, it sometimes seems impossible to find that elusive “balance” of it all. I’m very fortunate to work for a company who values family – in whatever form that might be (babies, fur babies, etc.). Leaving early for a kid’s soccer game or having to make a pediatrician appointment is never frowned upon (as long as the work is done). There’s a reason we are one of the Best Firms to Work For. Working for a company who understands and values the family makes it easier to find a work-family balance. But I have learned that it’s not up my employer, my spouse or anyone other than myself. I have to find a balance that works for me. . . which means that some things have to give. Sometimes I will miss that choir performance or soccer game. I’ve even been traveling away from home on a birthday. I am never able to chaperone a field trip. That’s just the way it is. The kids will be fine in the long run (and so will you if you can get over the parental guilt). Things have to be equal. No they don’t. Sometimes life isn’t fair and our children need to learn this. There will be times in which your job demands more of you than your family does – and vice versa. As long as you are showing commitment it all evens out in the end. Kids Always Come First. Really? If my partner (who owns his own business) and I always put the kids first, they’d have completely stressed out parents who are ragged, angry, unhappy and pooped. And our marriage would also suffer. How is THAT healthy for the kids? I’d lay down my life for my kids and give them both of my lungs or any other internal organ, yes. But barring tragedy like that, it’s healthy for kids to see you taking care of yourself. You want them to do the same when they are adults, don’t you? Missing Family Events Makes Me a Bad Mom. While it feels that way at times, I am confident that my kids won’t remember that game or performance I missed. They WILL remember that I was enthusiastic about their activities and their lives. Plus we have technology today that can allow us to virtually experience things we can’t be there for. I have watched videos of the soccer games with my son sitting by my side commentating the play by play. My 13 year old daughter recently took a school field trip to an aquarium (which, once again, I cannot chaperone). There was a fish’s name there that she found so funny she HAD to immediately text me a picture of the fish to laugh about it (the fish’s name was an adult-themed euphemism – ah, the joys of middle school). That was a joke we shared and laughed together, even though I wasn’t physically there with her class. I’m a Working Mom So I Can’t Take Time for Myself. I know in my head that this is wrong, that I have to take care of me. But after over a decade of working parenthood I’m still struggling with this one. I just can’t justify booking that massage on Saturday afternoon when I’ve been gone on a business trip since Monday morning. I’m wrong. I SHOULD book that massage. I’ll feel mentally and physically healthier, which is good for the whole family. In addition to these myth busters, I think the biggest thing I’ve learned in searching the right work-family combination is to draw imaginary lines. When I’m at work, I’m at work. Do not come to me with a tummy ache. Do not text me your middle-school drama. Grab a hot water bottle and we’ll talk about what Jack said to Alice (OMG!) when I get home. Alternately, when I’m at home, I’m at home. I do not constantly check email. If my colleagues or clients need me in an emergency, my cell phone will ring (and I’ll answer it), but otherwise I filter out everything else. Most of it can wait until morning. For now, that hot water bottle needs to be re-filled and we must decide #TeamJack vs. #TeamAlice.